The 60th Infantry Regiment was born on June 10th, 1917, at the historic Gettysburg National Park, Pennsylvania. In World War I the allegedly impossible crossing of the Meuse River by the 60th Infantry Regiment was regarded by military experts as indicative of the skill possessed by the American fighting man. This crossing and the brilliant records accomplished at Alsace-Lorraine and St. Mihiel were handed down to the 60th Infantry Regiment when it was reactivated at Fort Bragg, North Carolina on August 1st, 1940. 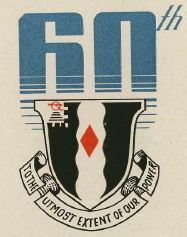 The 60th Regiment’s battle honors during World War II date from the campaign to control the northern shores of the African coast and keep open the Allied lifeline in the Mediterranean Sea. Highlighting this campaign for the 60th Infantry Regiment was the seizure of the Kasba (Citadel) in early November 1942. The “Go Devils” (their nickname) continued across North Africa with the Allies until the German-Italian Army Group Africa was totally destroyed. Sicily was the 60th Regiment’s next assignment and they landed near Enna on July 24th, 1943 to support the 1st Infantry Division. After numerous actions the cities of Floresta and Basico became the last Sicilian stronghold to fall to the might of the 60th Regiment. On August 14th, 1943, the 60th was ordered to halt and was put in reserve with the rest of the 9th Infantry Division to await its next assignment. 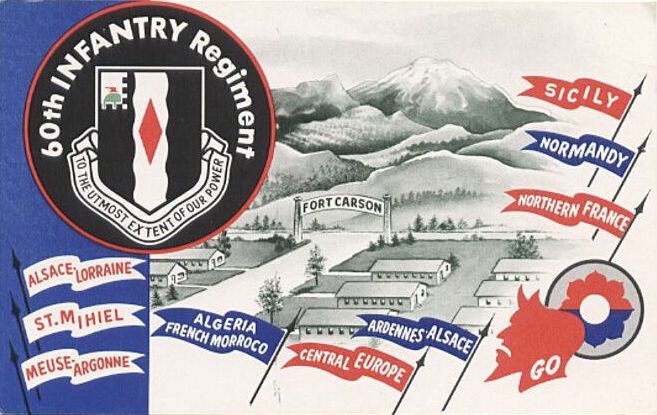 That next assignment called for the 9th Division to enter the battle of “Fortress Europe”. The 60th first taste of battle on European soil came on D-Day + 4, June 10th, 1944, when it joined the 39th and 47th Regiments for an offensive into France. One of the first orders given to the 60th Regiment was to march toward Ste. Colombe. In this action the 2nd Battalion achieved outstanding results. Driving hard toward the objective, 2nd Battalion completely outdistanced the rest of the Division. They overran the German defenses, set up a bridgehead on the Douve River and held the position for seven hours under heavy fire until the rest of the Division could catch up with them. For this aggressiveness the 2nd Battalion was awarded the Distinguished Unit Citation. During the next three months, the Allied pincers began closing on the German Fatherland, but two major obstacles stood in the way – The Meuse River and the Siegfried Line. After a lapse of 26 years, on September 4th, 1944, the 60th again found itself on the west bank of the Meuse River. By September 17th, the Hofen position of the Siegfried Line was being patrolled by elements of the 60th Regiment. After the Siegfried Line was breached the Allied drive continued toward the Roer River. In a quick change of direction, the 1st Battalion of the 60th Regiment diverted to capture the vital Germeter-Hurtgen road junction. Some of the most brutal warfare took place in this area and losses were high. After capturing the road junction they captured more prisoners than they had men present for duty in the Battalion. Even though the result of this battle was successful, many lives were lost during the weeks of the heavy and fierce fighting in the darkness of the Hurtgen Forest. The Ludendorff Bridge at the town of Remagen was used for a bridgehead on March 7th, when American troops captured it intact. The 9th Division quickly seized the advantage and prepared to cross the river. The 60th began crossing the bridge in the night of March the 8th, 1945, under heavy machine gun and artillery fire. The crossing took 24 hours. Now the job of “mopping up” began. Thousands of disillusioned German soldiers surrendered. The last objective of the war for the 60th and the 9th Division was Drohndorf, which fell on April 21th, 1945. Then on April 26th a patrol of the 60th contacted elements of the Russian Army and the East and West fronts were now one. 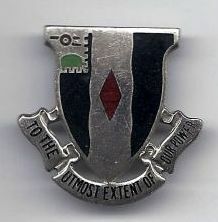 This link-up signaled the end of Hitler’s Germany and of fighting in World War II for the 60th Infantry Regiment.